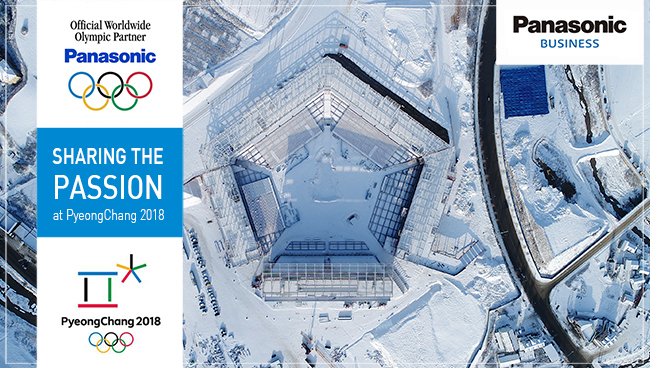 As a TOP1 sponsor for the Olympic Games and Official Worldwide Paralympic Partner, Panasonic will provide a wide range of Audio Visual and Broadcast solutions to support the staging of the XXIII 2018 Olympic Winter Games and the XII 2018 Paralympic Winter Games, both to be held in PyeongChang, Korea. 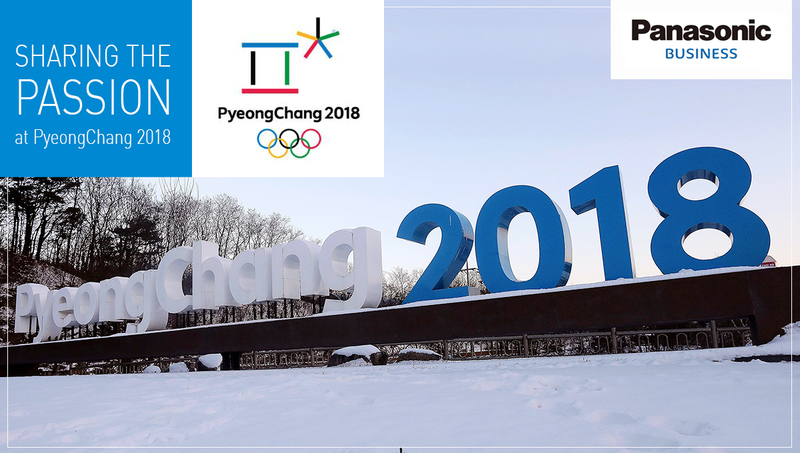 Through cooperation with the International Olympic Committee (IOC), the International Paralympic Committee (IPC), the PyeongChang Organising Committee for the 2018 Olympic and Paralympic Winter Games (POCOG), and Olympic Broadcasting Services (OBS), Panasonic will supply our state-of-the-art AV equipment to the opening and closing ceremonies, competition venues, and broadcasting locations. Panasonic has been a TOP sponsor since the Olympic Winter Games Calgary 1988, and the Olympic Winter Games PyeongChang 2018 will mark the 30th anniversary of our sponsorship. Over the last three decades, Panasonic has been contributing to the Olympic Games with our cutting-edge AV technology. Following our achievements in the Olympic Games Rio 2016 last summer, Panasonic will provide solutions using its latest AV equipment and projection mapping technologies as our core technology for the opening ceremony, scheduled for February 9, to assist with the staging of both the opening and closing ceremonies. 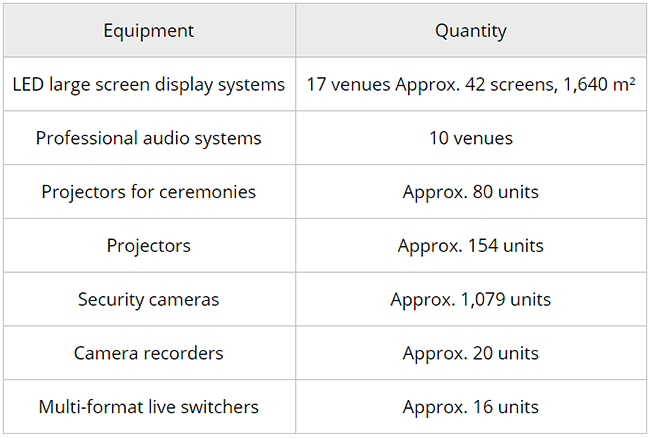 Panasonic will supply around 80 PT-RZ31K/RQ32K high-brightness compact 30,000-lumens class projectors, AV-HS6000 Series Broadcast Grade 2ME Live Switchers2, plus a full lineup of AV systems to the Olympic Stadium to support the staging of the opening and closing ceremonies. Panasonic will also install 42 LED video screens and video systems in the competition venues, giving a total screen area of 1,640 m². A multi-video distribution system and 360-degree cameras are planned to be adopted in the competition venue on a trial basis as part of our new initiatives toward 2020. Panasonic’s P2HD broadcast camera system has also been chosen as the recording equipment for PyeongChang 2018. We will deliver a mass of broadcasting equipment, including the AJ-PX5000G camera recorder featuring AVC-ULTRA codecs3 to the International Broadcasting Centre (IBC). Since the Olympic Games Barcelona 1992, the Olympic Winter Games PyeongChang 2018 will be the 13th Olympic Games in which Panasonic’s digital technology is used as the official recording format. Supplied to competition venues, athlete villages, press centre, and official live sites. 1 TOP stands for “The Olympic Partner.” This is the highest level of Olympic sponsorship. Panasonic has signed a long-term partnership with the IOC through to the Olympic Games Paris 2024. 2 2ME Live Switcher: A video switcher and synthesiser that switches or superimposes two or more videos. 3 AVC-ULTRA codec: H.264/AVC standard-compliant encoding scheme for broadcasting and commercial video signals.